In the past ten years or more Japan has seen a rise in the number of "New Religion" cults especially attracting Japanese young people (college through young career age). A common draw is the promise of inner fulfillment through a variety of techniques of meditation, yoga, mind control and asceticism. In 1995 the exposure of the Supreme Truth (AUM) cult behind the sarin gas attacks on the Tokyo subway and other parts of Japan shocked the nation. Mind control methods used by the cults have received wide attention from the media. This is an opportunity for the church to declare the Truth of God's Word. It seems that every month for the past five or six years a new scandal has been revealed among Japan's business and government leaders. A basic lack of interest in politics, coupled with complacency toward the democratic system, has allowed abuses in government. Kickbacks and payoffs constitute the majority of these scandals. And yet there is very little outcry from the ordinary citizen. Two celebrities won mayoral positions in Japan's two largest cities, Tokyo and Osaka, because of their position on clean government. Christian voices are seldom raised on political issues. Tokyo and Osaka are experiencing a drop in population as city-dwellers flee to the countryside for better living conditions. Commuting two hours one way to work has become the norm. Huge bedroom towns in the outlying areas of major cities are virtually vacant during the day. New approaches in evangelism are necessary to reach these communities with the gospel. In 1996 over 500 individual churches and pastors throughout Japan joined a new association of Christian churches with the purpose of encouraging revival. Some church leaders are concerned that this indicates another division in an already fragmented, frail church. There is frustration with the ineffectiveness of the church to bring change in Japan. Most seminaries and Bible schools are experiencing a decrease in student enrollment. However, Bible schools open to laypeople are experiencing record enrollments. Ochanomizu Bible Institute reports over 100 students enrolled each year. 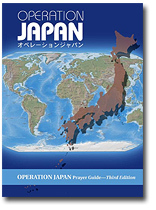 Japan to Jesus (JTJ) offers Bible school training by correspondence. Hundreds are enrolled each year here also. The "graying of Japan" is becoming a concern along with a projected decrease of the Japanese work force. Nursing homes have long waiting lists. The demise of the two and three generation household has begun as young families put their elderly in retirement and nursing homes. King's Garden nursing homes, a Christian ministry to the elderly, has met with great success with a dozen centers being built throughout Japan. Although partially funded by the government, the nursing homes are still free to hold daily chapels and share the gospel with residents, many of whom receive new hope in Christ. Matter-of-fact reports in national newspapers of junior and senior high school girls selling their virginity to businessmen for $500 to $1000 continue to alarm parent groups. Church Information Service continues to report declines in church school attendance among evangelical churches throughout Japan. Churches find it difficult to hold the youth once they have entered junior high. One evangelical university professor declared that the state of the youth is an indicator of the ineffectiveness of the Church's message.